There's allegedly more to that newly leaked all-metal Moto X 2016 design than we first thought, and it's good news for anyone who wants a more modular Android phone. Going along with previously outed photos of the Motorola-made smartphone is an explanation as to what those 16 pins on the back of the device could be: connectors for swappable backplates. That's right, Moto X 2016 is rumored to take customizable cues from the modular LG G5, but only it's supposed to have six modular attachments (not two) lined up called "Amps," reports VentureBeat. These modules are said to include a stereo speaker, battery pack, and a camera grip with optical zoom lens. There's also rumored to be a pico projector attachment for sharing media on the go. Better than LG G5 'Friends'? The LG G5 may be the first out the door with is modular attachments but the upcoming Moto X Amps may already have a leg up on its South Korea competitor. One of the biggest downsides of the LG G5's attachments is that users have to reboot the device when swapping attachments. From the leaked images, it looks like the magnetically attached Amps won't require the upcoming Moto X phones to be powered off. LG also suffered some quality control issues, with users complaining about a visible gap between the G5's chin and body. A person briefed on the Lenovo's plans to release modular backplates for the upcoming Moto X branded phones confirmed the rumor with VentureBeat. It appears Lenovo will be releasing two phones under the Moto X name called the Vector Thin and Vertex. Both phones have been tipped to feature the a 5.5-inch AMOLED display, but the budget Vertex will feature a resolution of 1080p, while the Vector Thin will have a more pixel-dense 1440p panel. The flagship Vector Thin will reportedly feature a Snapdragon 820 processor, either 3 or 4GB of RAM, and a 2,600 mAh battery. The phone will also come with 32GB of storage, but it's unclear whether either phone will feature expandable storage. While these are flagship specs, I'm concerned about the relatively small battery of the Vector Thin considering its 2K display. But that's the trade off you get for having a 5.2mm thin body. The mid-range Vertex sacrifices some power and resolution for a larger battery (3,500 mAh), which should yield two days of battery life. It may also be slightly thicker at 7mm. Users will reportedly have a choice between two Vertex configurations: a 16GB model with 2GB of RAM and a 32GB model with 3GB of RAM. Your decision between the two may come down to the camera. The camera on the cheaper Vertex will reportedly be 13MP and lack phase-detection autofocus. Nothing special here. Vector Thin, meanwhile, is said to have a 16MP camera with optical image stabilization, phase-detection autofocus. The inclusion of phase-detection means faster focusing and more accurate results. 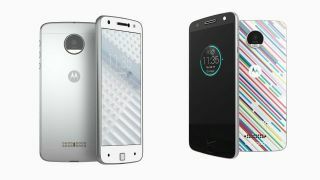 There's no release date or price information attached, but with two Moto X 2016 leaks in as many days, we expect a lot more news about these Android smartphones between now and their eventual unveiling.